Earlier this month, the HPWREN team worked with the Scripps Institution of Oceanography's Integrative Oceanography Division and UCSD Telecommunications to conduct a wireless network feasibility demonstration, as a follow-up to initial connectivity tests that took place in June. Field researchers are now able to take high quality images of the Santa Margarita river crossing - thanks to a newly installed camera that overlooks the river. The Ricoh RDC-i700 camera delivers more than three megapixels per image and is controlled from a remote server across the Internet. Although the ability for scientists to collect and store remote environmental field data is becoming more commonplace in today's wired world, researchers still need interdisciplinary repositories from which they can easily share and infuse real-time information straight from the field. 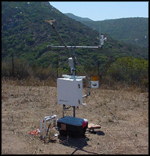 Along the shoreline of southern California, the Scripps Institution of Oceanography (SIO) is leading efforts to create an environmental observing/monitoring testbed that will demonstrate the collection and streaming of real-time seismic, oceanographic, hydrological, ecological, geodetic, and physical data via wireless networking. Earlier this month, the HPWREN team worked with the Southern California Tribal Chairmen's Association (SCTCA) to connect the first leg of their Tribal Digital Village Network (TDVNet), which is being funded by a grant from Hewlett Packard. Antennas of a relay station on Palomar Mountain now point toward Pala, Rincon, and San Pasqual American Indian reservations. Spanning more than 4000 acres, the Santa Margarita Ecological Reserve (SMER) is nestled between the Santa Ana Mountains in the northeast portion of San Diego County. Until last week, remote access to field data was only a dream. However, SMER scientists are now connected to the HPWREN 45 Mbps backbone and have the capability of accessing real-time field data from anywhere in the world. A truck hauling hazardous chemicals crashes in an urban environment, causing a poisonous plume to penetrate the area. Multiple government agencies ranging from the Police Department to the Department of Transportation are called onto the scene. All agencies involved have capabilities to dispatch information to one another via voice systems; however, the ability to transfer descriptive maps and images between the agencies is not possible. This scenario is not uncommon in urban areas, and a group of local San Diego government agencies recently collaborated with Space and Naval Warfare Systems Center San Diego (SSC San Diego) and HPWREN researchers to demonstrate the feasibility of incorporating real-time images and maps into such incident management situations. A group of high school students from San Diego county Native American reservations recently completed a summer Youth Academy sponsored by the Southern California Tribal Chairmen's Association Tribal Digital Village project. The HPWREN team worked with Academy students throughout the summer - answering questions regarding wireless networking, touring students through various laboratories, and providing guidance for their endeavors to connect additional tribes to the Tribal Digital Village Net. Kuo-Wen Lo, Angie Ng, Jeff Pinnow, and Carmen Zavala recently presented posters regarding their HPWREN research. The August 10 session was held at the San Diego Supercomputer Center (SDSC) Summer Student Poster Session. Three HPWREN antennas were recently mounted on the California Department of Forestry tower atop Red Mountain. While one eight-foot dish points toward Mount Soledad, another 4-footer points toward the Santa Margarita Ecological Reserve. The new connectivity extends the 45 Mbps HPWREN backbone. A July 31 Congressional hearing before the House Subcommittee on Research included testimony from HPWREN PI Hans-Werner Braun, a research scientist at the San Diego Supercomputer Center, University of California, San Diego. More than 50 years have passed since astronomers first started using the Palomar Observatory's 48-inch Oschin telescope to study the night sky. Known throughout the world as the meter-class-aperture telescope with the largest field of view, the Oschin's most recent "claim to fame" is its link to an NSF-funded 45 Mbps network - the High Performance Wireless Research and Education Network (HPWREN). The HPWREN team recently worked with UCSD Telecommunications and SIO's Center for Coastal Studies (CCS) to conduct a wireless network feasibility demonstration from Scripps Pier to Black's Beach. By extending a fiber optics network connection across the beach via a wireless ethernet bridge, scientists from CCS and the Woods Hole Oceanographic Institution (WHOI) will soon have the ability to relay real-time data from ocean sensors to their laboratories. The HPWREN team collaborated with UCSD Telecommunications to provide the recent Corporation for Education Network Initiatives in California (CENIC) conference with wireless connectivity. The connection provided a temporary two-day link from SDSC to Mount Soledad to Paradise Point, which was the location of this year's CENIC 2001 � A Network Odyssey. Last month marked an important event in the history of San Diego State University's 15-acre Mount Laguna Observatory (MLO). 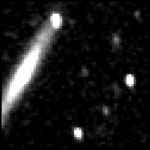 On the evening of April 16, astronomer Bill Welsh streamed images from MLO's 40-inch telescope to his laboratory at San Diego State University (SDSU) via the 45 Mbps backbone of the NSF-funded HPWREN. 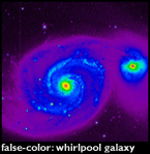 The following morning, the images were displayed to students in Professor Janet Wood's Astronomy 101 class. On Saturday, May 5, the HPWREN team will be participating in a wireless demonstration at the Santa Margarita Ecological Reserve, located in the local Santa Ana mountains. The activity will connect four points within the 4344-acre reserve to demonstrate several new techniques for gathering environmental data via wireless technology. Though the Rincon Indian Reservation sits deep in a northeastern valley of rural San Diego county, the HPWREN team eventually found a way to provide the hard-to-reach area with broadband connectivity. "The collaboration with HPWREN is very beneficial for our tribe's education center, as well as additional computer labs here on the reservation," said Hunwut Turner, Rincon Education Center Director. The HPWREN team recently worked with students at the San Jose Valley Alternative High School to provide the school and the Warner Community Resource Center with access to high-speed Internet. By extending their T-1 Internet connection across Highway 79 via a wireless ethernet bridge, Warner Unified School District now has the ability for all computers to receive broadband Internet connectivity. While the equipment was paid for by the school district, the HPWREN team participated in the installation and also provided technical expertise to guide the students through the deployment process. Despite wet and foggy conditions, HPWREN researchers and local California Department of Forestry (CDF) firefighters recently demonstrated a rapid response mobile wireless access point via a relay using tripod-mounted antennas. 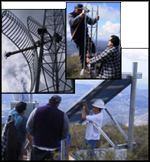 The connectivity originated from the HPWREN 45 Mbps backbone node at Mount Woodson, where an antenna was mounted atop a rock pointing toward Iron Mountain, the relay point, which communicated via an additional tripod-mounted antenna with Dos Picos Park, a pre-determined incident base for CDF firefighters. Today's seismologists can view activity from the earth's interior as it occurs - enabling scientists from around the world to gain extensive insight into the often elusive patterns of seismic waves. However, current seismic research techniques only allow researchers to look at rather broad datasets, which is not always enough information to determine the exact cause and effect of an earthquake. Frank Vernon, a researcher at SIO's Institute of Geophysics and Planetary Physics (IGPP), is taking real-time data collection and distribution one step farther with HPWREN. Located just below Palomar Mountain at 2400 feet, the La Jolla Native American Reservation's Learning Center serves both young and old - with a rather extensive book selection and a computer lab that now has high-speed Internet access via UC San Diego's High Performance Research and Education Network (HPWREN). Because of the learning center's remote location, however, extending HPWREN to the site was quite a challenge for Hans-Werner Braun and his colleagues.